Tiki torches are a weird way to keep mosquitoes away, but I was told that it actually works. So I set out and started to do some research on the topic of finding some great outdoor mosquito repellents. In particular, I think it would be fun to zoom in on the tiki torch story. I wanted to share those results in this short article with you guys. Let’s find out what really repels a mosquito in the backyard. Enjoying a warm summer evening on the backyard patio with friends or family can sometimes be a struggle. It might not be due to loud neighbors, the lack of extra chairs during the barbeque, or perhaps your annoying uncle joining the party. But I’m talking about some of the most unwanted guests of them all: The female mosquito (and similar blood-lusting creatures). Getting rid of mosquitoes in the yard can be a struggle. Can a decent amount of fire and smoke (in the form of a tiki torch, perhaps) be of any help? Let’s look at the fire ánd the smoke components separately. Does Fire Attract Or Repel Mosquitoes? Mosquitoes are attracted to the heat of the human body. 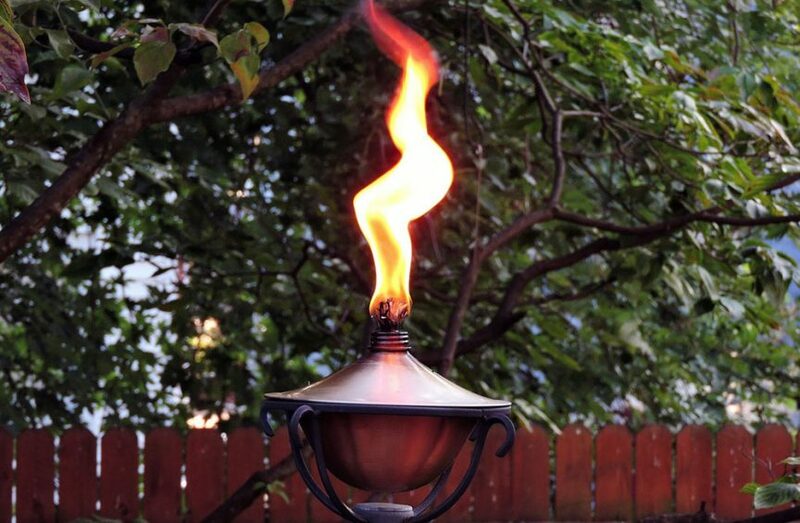 This would make a fire in the yard (for example from a tiki torch or a barbeque) a way to attract mosquitoes, instead of a repellent. Attracting mosquitoes with fire isn’t effective, since a mosquito will be naturally repelled by the scent of burned objects. When you think about it, this makes a lot of sense. Most animals in the wild will have some sort of defense mechanism inside their brains to protect themselves from a forest fire, for example. Even mosquitoes don’t wish to be burned alive by flames, nor do they feel the need to suffocate due to excess smoke coming from the fire. However, please note that setting your garden on fire will not get rid of mosquitoes all together. Most of the mosquito life is spent under water, as eggs, larvae, but also during puberty. It’s only during adulthood that these creatures will come out of their H2O-bubble (literally), by flying to us humans and putting their little stinger inside our skin. That’s what the females do to get the nutrition needed to produce the eggs for the next generation of annoying insects to be born. Contrary to popular belief, smoke will actually not repel mosquitoes. This is true for most common types of smoke: Campfires, weed, cigarettes, cigars, or any tobacco product. None of these will repel mosquitoes, since they don’t naturally dislike these scents. Only smoke of citronella candles does help repel them. This is why mosquito coils will have added scents to them in order to repel insects, instead of just the smoke from the device. You’ll need something citrus-like, or even just spicy in order to get rid of those annoying insects. Smoke will not attract mosquitoes either, no matter how much BBQ or grills you organize in your garden. All they will really do when you smoke them out, is to fly around the smoke and simply attack you that way. The attraction of the CO2 in your breath, together with your body heat will be much more attractive to the average female insect than that bit of smoke being a nuisance to them. It’s not an effective way to get rid of them at all. As it turns out, this whole notion of smoke repelling a mosquito is based on an urban myth. That includes those fancy tiki torches of yours, in case you were wondering. Prevention: The number one thing you need and should do against the insect infestation on your patio, is to get familiar with some of the ways to kill them beforehand. The precautions are pretty easy to remember. Remove standing water, spray yourself with repellent, wear light-colored clothing, avoid drinking beer, don’t be pregnant, circulate the air (with a fan, for example). The full list of preventive measures can be found right here. Mosquito traps: This is one of my favorite ways to remove large amounts of annoying insects from the backyard. It’s not only cool to see, but also highly effective! I’ve used several devices over the years and they have never let me down in my personal fight against pests in my garden. Currently, I’m sporting the Flowtron BK15D, an absolute monster at killing all sorts of outdoor flying pests. You don’t even need to look for its competitors, because this one is the best one you’re going to find for the price. I’ve already done the research for you! The full review can be found here. Mosquito foggers: Where magnet traps are the squad leaders of the gang, the foggers would be the invisible ninja army. These silent killers will spread a fine mist of human and pet-friendly insecticide in your garden, in order to kill everything that’s out to get you. And it won’t harm the good guys like bumblebees or butterflies either. It will specifically target mosquitoes. Isn’t that cool? I’ve made a comparative overview of the best fogging devices right here, which is really all the information you are going to need to get started with one of these bad boys. Repellent plants: A natural way to get rid of mosquitoes is by cleverly using scents. While this method will be a lot less effective than some of the others I have discussed, there is no question that strategically positioning some basil, lavender, or other repellent scents in your yard will have some effect. It will both make your garden look flowery and lush, while at the same time doing something good to keep the annoying monsters away a bit more. Don’t use this method in isolation, because you’re going to get stung at some point. Please see it as the first line of defense. Here’s an overview of some of the most commonly used species of plants for this specific purpose. Mosquito Joe: In a moment of true desperation, who you gonna call? Ghostbusters! No, Mosquito Joe of course. You want to call the professionals to help you get rid of the insect infestation in and around your house. In case you might have a party outside in the upcoming days, you could consider this final option. But please be aware that this is an absolute last resort measure. And it will only last you a couple of weeks of freedom, if any at all. If you want to know about my experience with this company, or just want some more info about this option, please read my full Mosquito Joe review here. Is A Tiki Torch A Good Or Bad Mosquito Repellent? A tiki torch will not repel mosquitoes effectively. Smoke and fire will be avoided by a mosquito (because this is a survival instinct in case of forest fire), but they are not specifically a deterrent against mosquito bites. 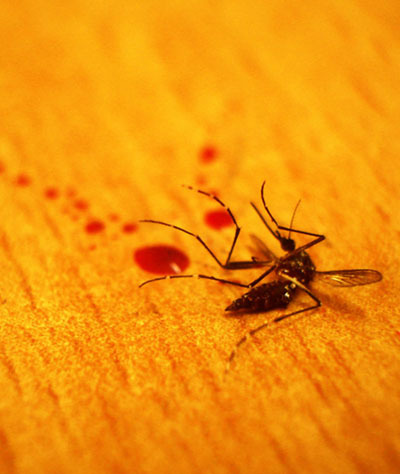 Filling your garden with tiki torches will not help you get rid of mosquitoes in your yard. So there you go, we learned something productive and useful today. Now go and run into your yard and smash those tiki torches in half! They’re useless, useless I tell you! Ahem. Joking aside, it’s really better for you if you would just invest in some high-quality anti-mosquito products for the garden, such as a mosquito fogger or an outdoor insect trap. These are proven to be highly effective, and they’re not even that expensive. If you want to get a feel for the full range of available and effective anti-mosquito products (at least those that I’ve personally tested and reviewed over time), please check out the main overview page right here. And as always, happy hunting and try to enjoy your time outside, with or without biting monsters in the yard!